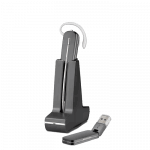 USB Phone Headsets - Finding the Perfect One - Headsets Direct, Inc. Using a USB phone headset will make your life easier and your office work effortless. By using a USB wireless headset, communication is made easy. This growing technology has proved its worth within a variety of professional fields. Whether you work in-office all day, or are on the road, a USB phone headset will make everyday communication easier with its hands-free capabilities. The trick is finding the headset that is best for you. Depending on what your priorities are, whether they be audio quality, battery life or comfort and design, Headsets Direct has the one you will need. Deciding your priorities should be done first. Consider your day-to-day routine. What is the worst part about using your current communication technology through your computer? For those interested in finding the USB headset dedicated to high quality output, take a look at the Plantronics W420 Savi Wireless Computer Headset. With both ears covered with comfort padded headphones, the stereo quality outweighs its competitors. The superior sound quality uses wideband support and DECT technology. Unlike old analog technology, Digital Enhanced Cordless Telecommunication (DECT) devices can offer sharper and more defined stereo quality. The clarity of sound will not lessen within 300 feet of the dock allowing you to move freely throughout the office to continue with inner office communications while never missing a call. While high quality output is important, you may decide that overall you are concerned about battery life because you need to be able to use your USB phone headset all day long without having to stop and charge it up. How about a technology that can detect if you are wearing the headset and will turn off if you’re not wearing it? We thought it was a good idea too. The Voyager Legend UC B235 is one of the most versatile headset models we have. These have Smart Sensors located on the inside of the ear loop. These sensors will detect if you are wearing the headset and will use less battery by staying on standby while you’re not wearing it. This model comes with a free charging case. Whether you remember to put your USB headset into the case before putting it away or not, the Voyager Legend series of headsets are extra durable making an occasional carry in the pocket or purse directly should not affect the hardware of the headset at all. When the Smart Sensors detect you are wearing your headset again, it will automatically turn on and be ready to use. This technology is very similar to an iPhone or other common touch screen technology. This will save the battery life exponentially. The free charging case mentioned will give you an additional 14 more hours of talk time! All headsets are designed to wear all day and go unnoticed. There are certain styles that have been purposefully redesigned to maximize the comfortably even further. 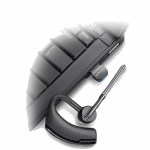 The Plantronics W440 Savi Wireless Computer Headset is light, durable and has high audio quality and battery life to make it the perfect trifecta of headset necessities. This design is one of the more popular because of its noise-canceling and Enhanced Digital Signal Processing (DSP) microphone that helps screens out background noise from your conversations. 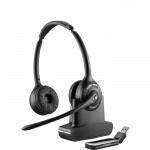 Whatever specifications you have for the perfect USB phone headset, Headsets Direct has the variety of high quality choices to appease your desires.